New Delhi : India ranks first when it comes to the number of deaths due to lung disease, and is 14th on the list when it comes to those who die due to bronchial asthma, a WHO report in 2014 said. The report added that India has an estimated 15-20 million asthmatics. The WHO also states that 300 million people suffer from asthma worldwide, which means that nearly 5% of the world’s asthmatics come from India. About 98% of cities in low- and middle-income countries with more than 100 000 inhabitants do not meet norms set out in the World Health Organization’s (WHO) air quality guidelines, according to WHO’s global urban air quality database. An increasing number of Indian cities are now measuring and reporting their air pollution levels to WHO and the number of such cities, globally, has nearly doubled to 3000 in 103 countries since 2014. These numbers are a sharp indicator of the air we breathe on World Asthma Day. While it’s still difficult to pinpoint the reason behind asthma, there are several factors that exacerbate the condition. 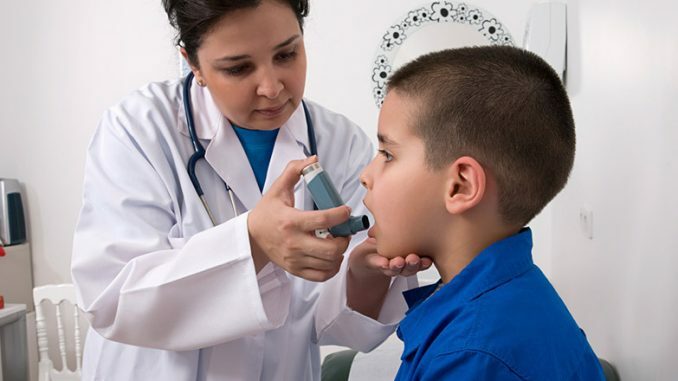 Asthma attacks all age groups but often starts in childhood. It is a disease characterised by recurrent attacks of breathlessness and wheezing, which vary in severity and frequency from person to person. This condition is due to inflammation of the air passages in the lungs and affects the sensitivity of the nerve endings in the airways so they become easily irritated. In an attack, the lining of the passages swell causing the airways to narrow and reducing the flow of air in and out of the lungs. Last year, a poll conducted by Curofy — India’s largest community of doctors, said that 82% doctors say there has been an increased asthma incidence in children due to increased environmental pollution. While 11% of the doctors polled blamed second and first hand smoking, seven percent chose genetic predilection as the leading cause for increased childhood asthma. Reducing the deaths and ill-health from air pollution is one of the targets of sustainable development goal three and, last year at the United Nations climate change conference in Paris, governments recognised the need to curb emissions to reduce global warming. The sources of India’s air pollution are many: indoor cook stoves, road traffic, industrial plants that burn fossil fuels and open burning of waste. According to Dr Sameer Nanaware, Consultant – Pulmonology, Global Hospitals, Mumbai, asthma is carried from one generation to another, but there are several external factors that can cause the disease. “These include continuous exposure to air pollutants which happen in industrial or workplace exposure. Allergic bronchitis is also another term loosely used for asthma and recurrent episodes of allergic bronchitis could actually be asthma only,” he said. Dr Nanaware’s reasoning is corroborated by a WHO report that says exposure to tobacco smoke and exposure to chemical irritants in the workplace are additional risk factors. Other risk factors include certain drugs (aspirin and other non-steroid anti-inflammatory drugs), low birth weight and respiratory infection. The weather (cold air), extreme emotional expression and physical exercise can exacerbate asthma. While addressing the pollution levels in urban India, Dr Nanaware said that a change in atmospheric level of pollution will certainly reduce the symptom as well as the progression of the disease. “Stringent regulations for automobiles especially diesel vehicles, industries which emit smoke and fumes and construction sites where dust and cement cause similar problems are needed to reduce the same,” he said. Urban India isn’t the only problem when it comes to asthmatics. Rural India, too has its list of patients. Dr Nanaware attributes factors such as pollen or hay, as well as burning indoor biomass fuel, “This not just causes asthma, but also results in a complication non-smoking Chronic obstructive pulmonary disease,” he explained. In 2015, a special committee set up by India’s federal Ministry of Health and Family Welfare, submitted a report to the Centre on the devastating effects of air pollution on people’s health in India. The committee proposed measures that claimed would provide the largest reduction in exposure to air pollution and, as a result, improvements in people’s health. For K Srinath Reddy, the president of the public health foundation of India, who co-chaired the committee, the report is important because it highlights the contribution of air pollution to the rise in cardiovascular diseases in his country. Proposals included switching to clean energy sources for cook stoves, public transport and industry, as well as measures to reduce road traffic by raising fuel taxes and parking fees, levying congestion charges, and creating vehicle-free zones and cycle paths. While this looks practical on paper, there’s still a long way to go. An example of this is Delhi that has made its public transport run on compressed natural gas, and has an expansive metro system. Yet, last Diwali, Delhi was recorded as the most polluted city on the planet. Veerabhadran Ramanathan, professor of Atmospheric and Climate Sciences at the Scripps Institution of Oceanography at the University of California, San Diego, in an interview with WHO said that if India was to curb its air pollution, then three things need to be done. “One, replace existing cook stoves with clean cook stoves, two, reduce pollution from diesel transport and, three, restrict open burning of biomass and fossil fuels,” he said, adding that air pollution would reduce by one-third if clean cooking stoves were given to all its villagers. While the Ministry of Environment in its 2016 guidelines spoke of a number of factors including car pooling, use of alternative fuels in transport, and alternative sources of power, there is still a need to highlight that clean cooking fuel may play a major factor in curbing air pollution, and thereby controlling bronchial asthma in the country. Until then, we can only hope.